CommunicAsia 2017 is the premier sourcing and knowledge ICT platform in Asia. This year CommunicAsia will focus on cutting edge technology solutions for business. If we talk about Asia pacific, 86% of organizations are taking advantage of emerging technologies such as IoT, Enterprise mobility, Virtual reality, beacons, hardware integration, artificial intelligence, etc. But are they all aware of security challenges and possible advantages return? No? Don’t worry; CDN Solutions Group can answer this for you. 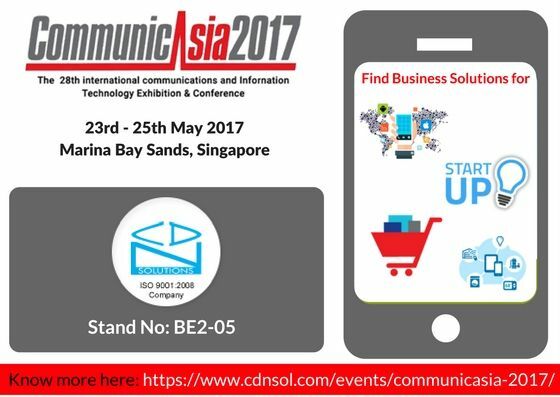 Why to Meet CDN Solutions Group in CommunicAsia 2017? You can meet CDN Solutions Group if you are looking for below solutions. CDN Solutions Group will talk about how to correctly Implement the Digital Age Solutions to stay away from security Issues. How can you avail maximum ROI from latest technologies? How retailers can take benefit of trending business model? Isn’t it amazing to find all advance technology solutions for your business under one roof? If you also want to take advantage of all these solutions, fix a meeting with CDN Solutions Group now and take advantage of advance technology solutions in CommunicAsia 2017.